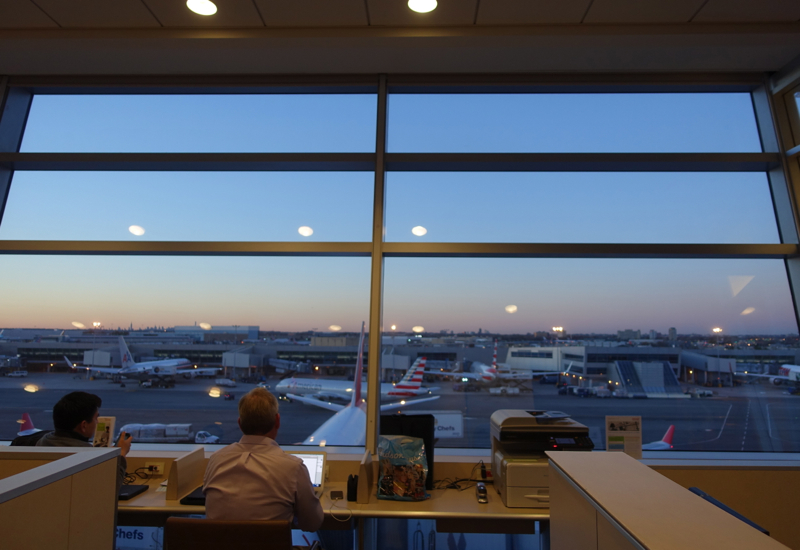 This AA Admirals Club Lounge at JFK Terminal 8 review is from a recent visit prior to an American Airlines Business Class flight to Europe, booked with AAdvantage miles. Note that this award is increasing from 50,000 AAdvantage miles to 57,500 AAdvantage miles each way, with the American AAdvantage 2016 Award Chart Devaluation. There are a couple Admirals Club Lounges at JFK Terminal 8, one on the mezzanine level 4th floor, shortly after clearing security, which we visited, and another close to gate 42 in Concourse C.
Both lounges open at 4:15am, with the main Admirals Club Lounge closing at 11pm, and the one near Gate 42 closing at 9:30pm. Exception: You have access if you're flying first or business class on an AA transcontinental nonstop flight between JFK and LAX, JFK and SFO, and LAX and MIA. 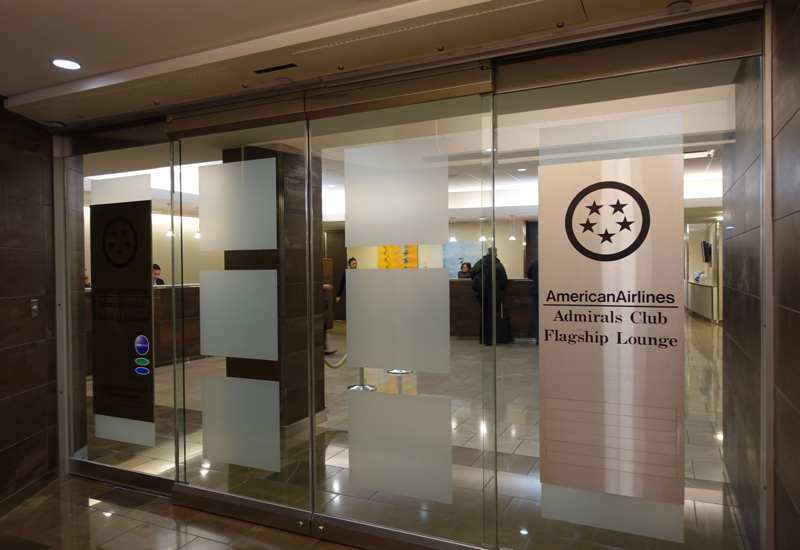 Oneworld Sapphire and oneworld Emerald elite frequent flyers have access to Admirals Clubs if they're departing on a oneworld marketed and operated flight, regardless of class of service. 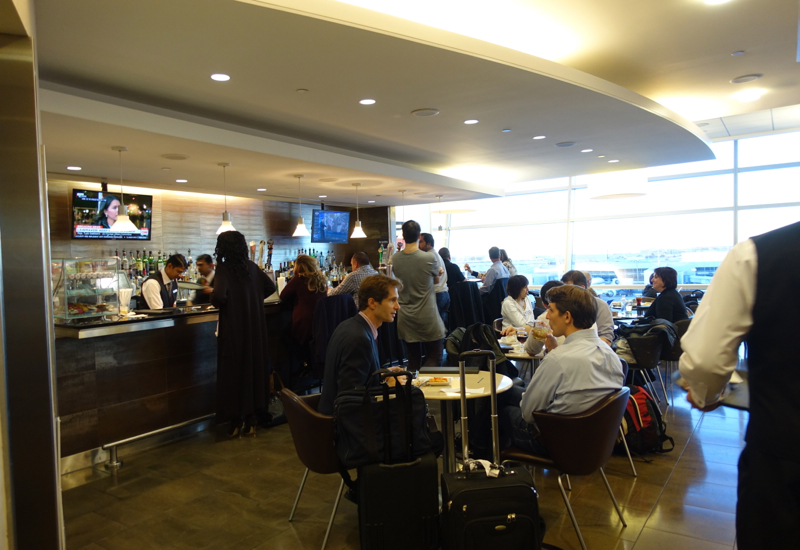 Although fairly large, with many seats in the main lounge area, the bar area, and a few in the business center area, the Admirals Club lounge seems to be packed every time I visit it. Good luck finding three or more seats together, if you’re traveling as a family or small group. We were lucky to find two seats together when a couple businessmen vacated their seats near the snack buffet area. Other lounge amenities include WiFi, which worked well for my purposes of reading and responding to email, though I didn’t try to upload anything during my visit. The password is displayed at reception, when you check-in. The lounge also offers shower rooms, which we took advantage of. 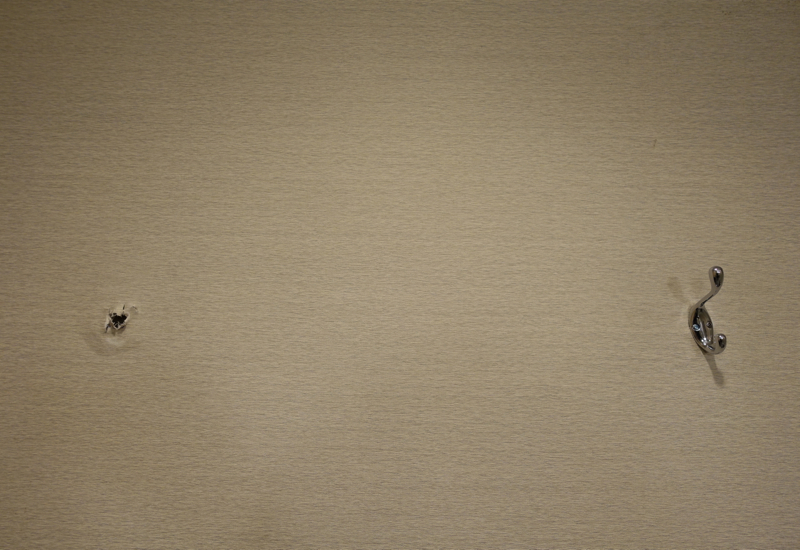 Ask either at reception, when you check-in, or any lounge staff if you’re already in the lounge and wish to shower. 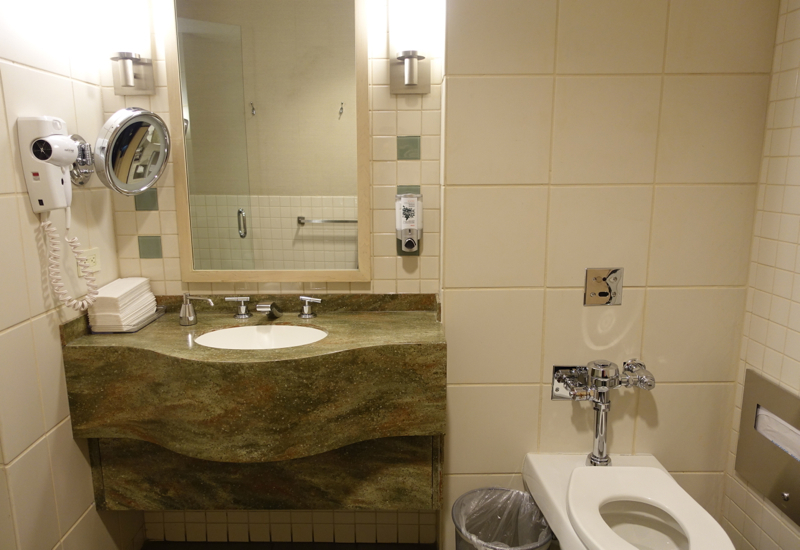 The shower room was basic, but at least was cleaner than the Airspace Lounge I visited a few weeks ago. A full set of towels and a bath mat were provided on the bench, and the shower reached my desired water temperature quickly, though the water pressure was on the weak side. 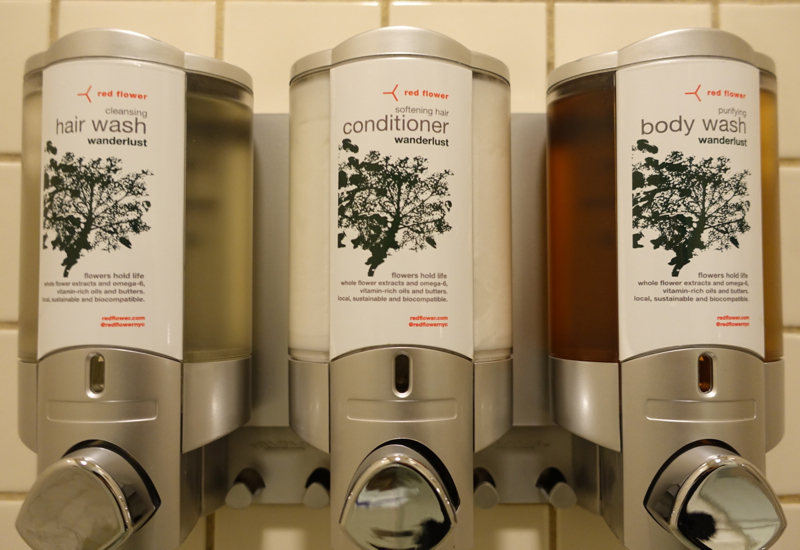 Bath products were by Red Flower, and in wall-mounted dispensers. If you need items such as a razor, shaving cream, moisturizer, comb and the like you’ll need to bring your own, since none were provided. 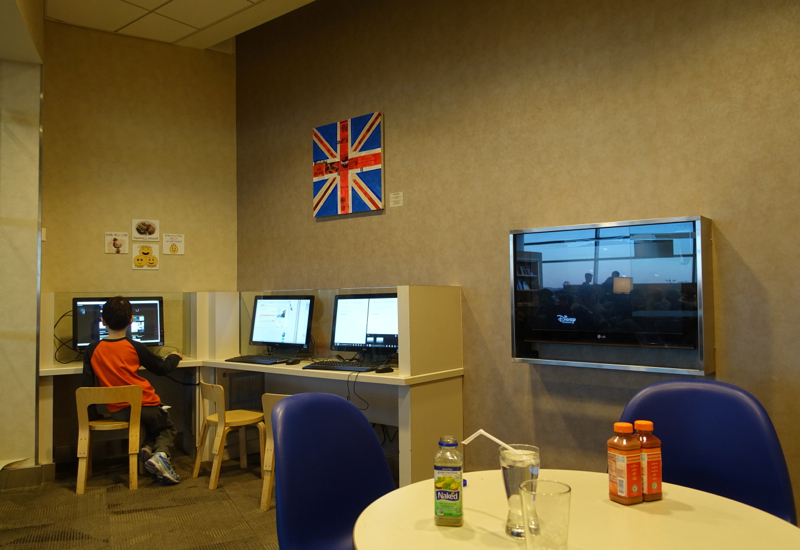 The lounge also offers a kids’ room, though it is for older kids, with 3 computer terminals (only one of which worked and was connected to the Internet) and a TV tuned to the Disney channel. 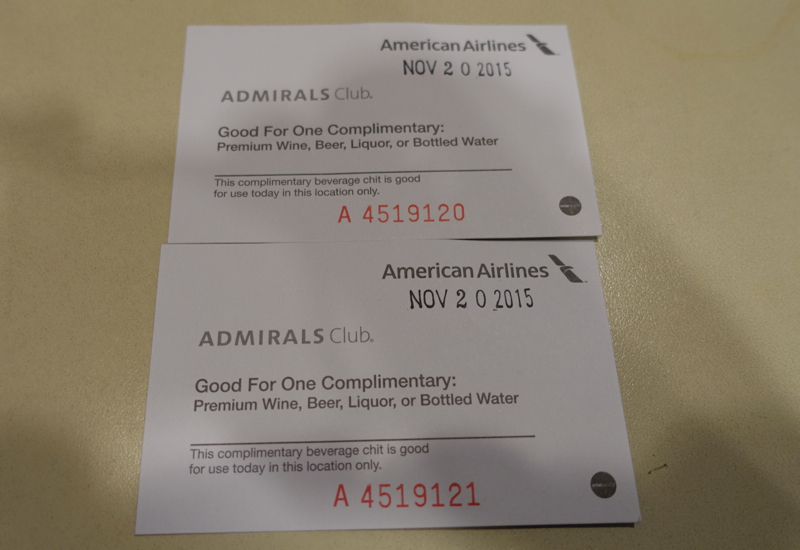 When you check-in to the Admirals Club Lounge you’re given two premium drink coupons per person, which can be used for any drinks at the bar, alcoholic or non-alcoholic. 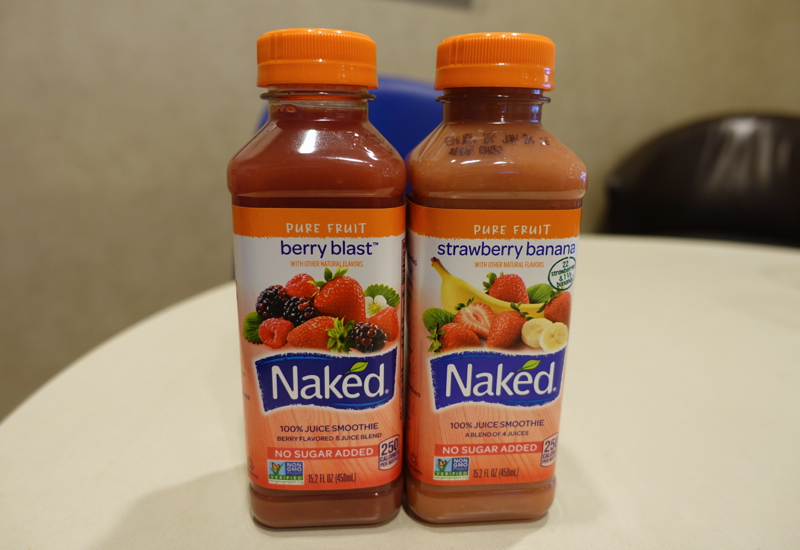 We decided to use ours for Naked Juice bottled smoothies, which seemed to be the best non-alcoholic option. 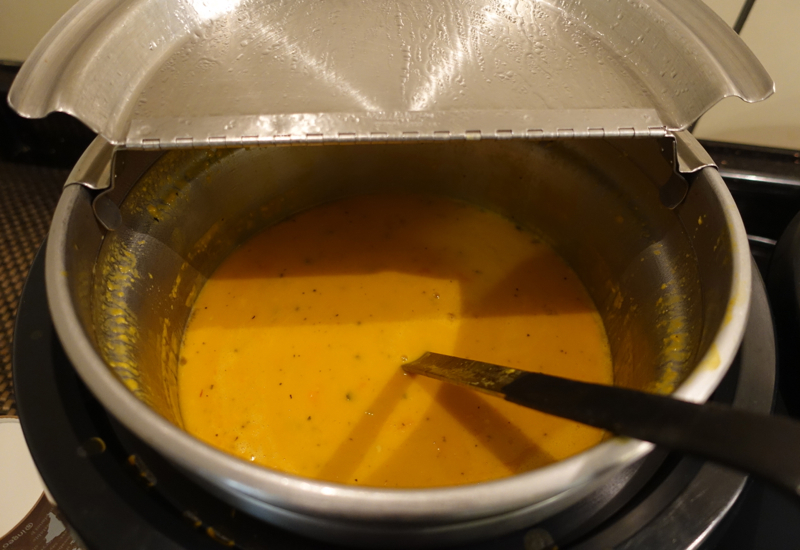 Two soups were also on offer, including this pumpkin soup that I tried. It was decent, taste-wise, but afterwards I didn't feel so well, and it was the only thing that I ate in the lounge apart from the Naked Juice, so I wondered how long it had been sitting out. Also be sure to check the description if you're vegetarian, since it was noted that the pumpkin soup contained meat. 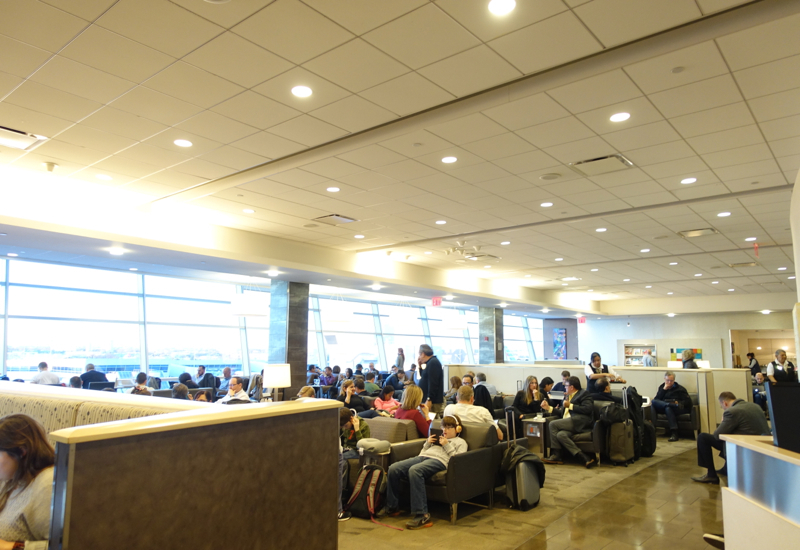 One thinks of an airport lounge as providing a relaxing place to wait for a flight, but I can’t say the American Admirals Club was relaxing, given the sheer number of other passengers there and scarcity of seating. I did appreciate the shower room, which while basic was the most relaxing part of the lounge, as it offered some personal space and the chance to refresh. 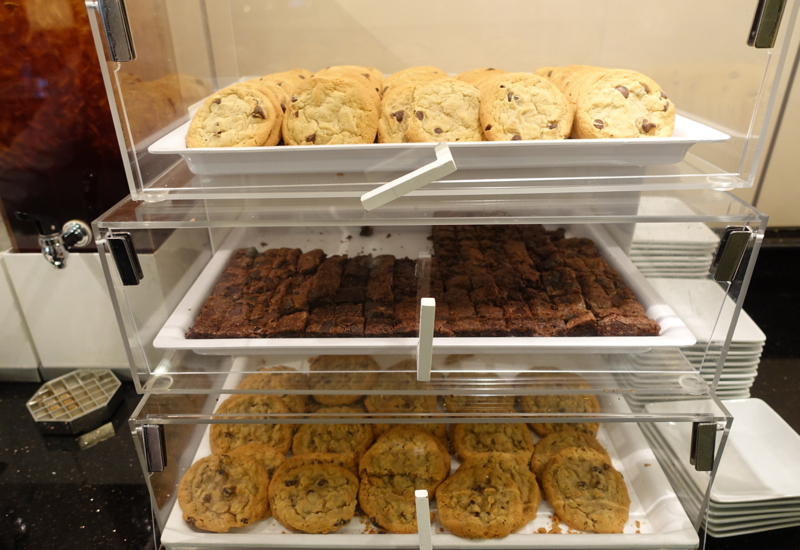 As with all U.S. airline operated lounges, I wouldn’t recommend arriving famished at this lounge, but the snacks can tide you over until your flight, or you can enjoy a complimentary drink or two. 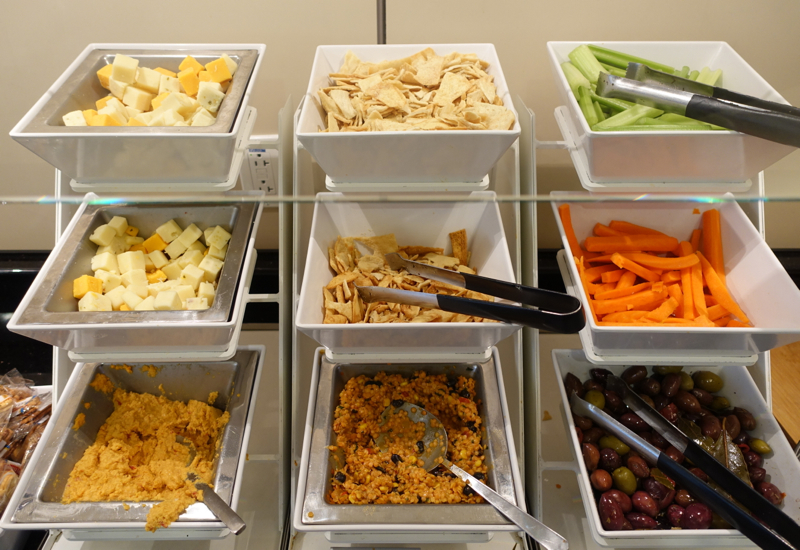 If you’ve visited the Admirals Club Lounge at JFK Terminal 8, what was your experience?